Enjoy sundowners by the Save river. Dine under the stars to the sounds of nature. Visit a local Shangaan village. Explore this often overlooked area of Zimbabwe. Indulge yourself in pure wilderness. Chilo Gorge Safari Lodge has an excellent vantage point, perched high on a rocky outcrop with views of the Save river below. The water is a big draw for wildlife in the area and guests can often see hippo and elephants drinking in the river. Each of the ten chalets has its own private balcony where you can sit and enjoy the magnificent views of the river. The thatch roof helps to keep things cool, and the large patio doors allow breezes to flow when opened. The furniture is locally made from natural woods and the decor is in natural warm muted tones with bright fabric finishings adding some colour. The double storey main building is made of timber and stone under cover of a large thatch roof. It houses lounge areas, a library, dining area and a well-stocked bar. To the front is a large swimming pool and patio area surrounded by tended gardens. This area makes a perfect location for dining under the stars on warm, clear nights. The food is excellent and served with a friendly smile by the staff. Warm Zimbabwean hospitality is evident here. 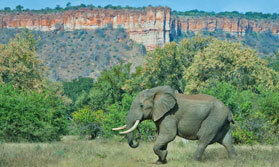 There is a host of activities on offer in this seemingly undiscovered corner of Zimbabwe. From the usual game drives and exhilirating guided walks to a full day trip to the spectacular scenery of the Chilojo Cliffs, a perfect spot to enjoy a picnic lunch. You can also trek through rugged landscape to visit Chivilia Falls, located 3km from the lodge to the viewpoint where you can watch water cascading down onto ancient rocks. A visit to the Mahenye village is both rewarding and educational. The Cultural home was built with funds raised by Chilo, it provides an intersting insight into Shangaan society. Follow this up with a relaxing sundowner down by the river Save and your day will be complete. Open: Chilo Gorge Safari Lodge is open all year round. Location: Nestled on a rocky outcrop above the river Save, Gonarezhou. Rooms: There are 10 thatched chalets each en-suite, tastefully furnished and with a private balcony with river views, the perfect spot to watch hippos and elephants go about their business in the river below. Activities: Game drives into the wilderness of Gonarezhou are offered here together with guided walks, day trips to the epic Chilojo Cliffs, cultural visits, all finished off with sundowners on the Save river. Facilities: The main buidling is double storey, with inviting seating areas, a bar, small library and dining areas. There is also a swimming pool and patio area overlooking the river below. Dining: Meals are served at individual tables in various locations both indoors and outdoors. Communication: The lodge has WI-FI, a land line telephone, there is also mobile reception.